For decades silicone technology has been synonymous with durable sealing in the construction sector. 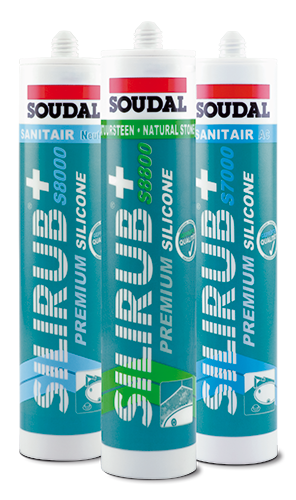 Silirub+ is a premium quality range of sanitary and natural stone silicones. This range includes acetoxy and neutral silicones for use in sanitary applications. Our neutral silicones distinguish themselves with their ease of use, low odour and excellent primerless adhesion on virtually all surfaces, including most modern plastics. These state of the art products are totally colour fast, with powerful anti-fungicidal properties and maintain excellent long term mechanical characteristics in all weather conditions.